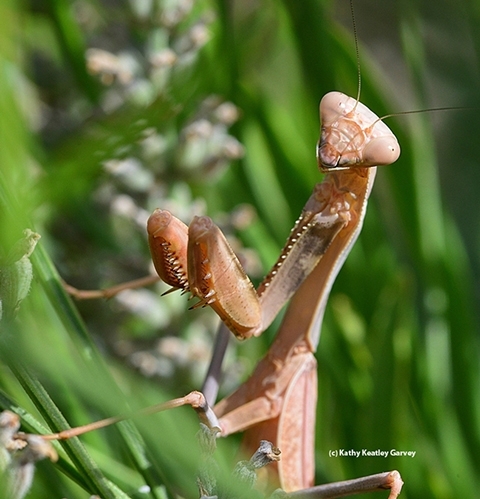 Have you ever seen a pink praying mantis, Stagmomantis californica? 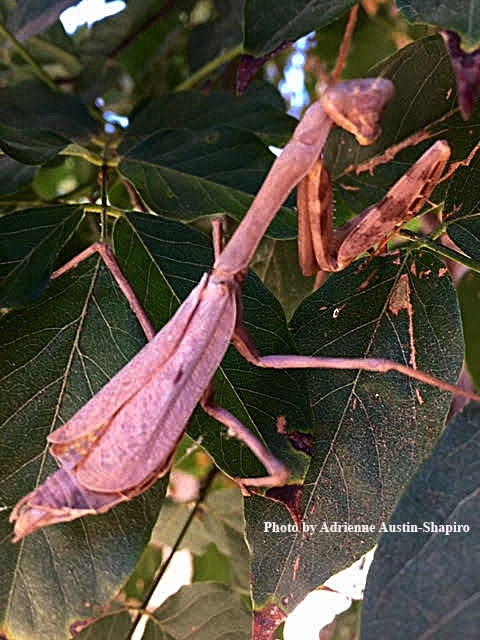 Adrienne Austin-Shapiro of Davis yesterday spotted this pink praying mantis (below) on the second-floor wooden planking above Blondie's Pizza, 4th and G streets, Davis. She rescued it and placed it in better habitat--shrubbery---where she photographed it with her iphone. Her husband, Art Shapiro, distinguished professor of evolution and ecology at the University of California, Davis, emailed this remarkable photo to us. "I've never seen a pink one--only pink katydids--though there is, of course, the famous pink Malaysian orchid mantis," he noted. "I imagine that molecularly, it's probably a similar mutant to the pink one in katydids--which is, by the way, dominant to green--but heavily selected against by visual predators." Stagmomantis californica, commonly known as the California mantis, is native to the Western United States. There are green, yellow and brown varieties. From Wikipedia: "Like all mantids, the California mantis is carnivorous, consuming virtually any other insect it perceives as small enough to be eaten, including other members of its own species. Males and females come together to reproduce but otherwise the adults are strictly solitary. Nymphs hatch in the spring from hard egg cases laid the previous fall. Adults do not overwinter—lifespan is seldom more than one year and usually less than nine months, with females sometimes surviving longer into the winter season than males, presumably allowing the females more time to lay their oothecas on suitable vegetation or rocks before dying. Though fast runners, both sexes are also capable of using their wings for flight, and the males are especially good flyers: the wings of the male extend well beyond the end of the abdomen, whereas those of the female do not extend more than half this distance. Males are often attracted to bright lights at night and can sometimes be found swarming around them along with other insects, though as ambush hunters, they fly at night primarily for dispersal and not in search of food." So, a pink katydid? Yes, see one on the mudfooted.com website. (Katydids are usually green and are well camouflaged in green vegetation.) But now, a pink praying mantis? Well, let's see, it could camouflage itself on such pink flowers as foxgloves, salvias, zinnias, dahlias, roses, clover, orchids, violas and candytufts. A first for me. Thank you, Adrienne and Kathy. I saw on in my yard today (7/31/2017) in western New York. Saw one in our RV in Colorado. Son took pic. Why are they so far from home? Saw a pink mantis this morning (8/18/2018) in the vegetable garden. Location Pearblossom, California. Found a pink mantis this morning (8/26/2018) in my Escondido, CA home. Relocated to geranium on the front porch where we had a little photo shoot! Spotted one today in Mission Valley, San Diego, Ca. Pictures available.